A lecture by Geospatial Technologist Dr Ed Parsons (Google) as part of the 'Out of the Ashes' lecture series. Maps are more used today than at any point in history. Many of us use maps every day, sometimes many times a day. Maps, delivered via apps on the mobile devices we all carry, are as much part of our lives today as credit cards and reading glasses. The term map is itself is perhaps no longer appropriate as these maps are, in fact, visualisations of massive real-time databases that mirror the world around us. Behind these highly-interactive maps, a network of services provide a real-time nervous system of road and rail conditions, weather, the temperature of our homes and even how busy our favourite pub is! This is the system Parsons terms ‘ambient location'. He argues this will form a key building block of the future smart cities will we inhabit. But - and there is, of course, a ‘but’ - stresses this real-time mirror of the world is, by its very nature, different to the world-view reflected in traditional cartography and the maps of the past. Maps on our mobile phones are ephemeral in the extreme, only representing the world as it is now, rejecting the past to analytical use at best and in most cases to irrelevance. This lecture asks how we have reached this point and to what extent it is a problem. Ed Parsons is the Geospatial Technologist of Google, with responsibility for evangelising Google’s mission to organise the world’s information using geography. In this role he maintains links with Governments, Universities, Research and Standards Organisations which are involved in the development of Geospatial Technology. He is a member of the the Board of Directors of the Open Geospatial Consortium and was co-chair of the W3C/OGC Spatial Data on the Web Working Group. He is a Visiting Professor at University College London and an Executive Fellow at the University of Aberdeen Business School. He earned a Master's degree in Applied Remote Sensing from Cranfield Institute of Technology, holds a Honorary Doctorate in Science from Kingston University, London. and is a fellow of the Royal Geographical Society, and a professional member of the British Computer Society. Creating, destroying and recovering human knowledge and cultural heritage - these are themes with enormous contemporary resonance. They are also processes with a deep history, both in an Irish context and across the globe. This three-year lecture series explores the theme of cultural loss and recovery across the centuries, from the Library of Alexandria in antiquity to the destruction of the Public Record Office of Ireland at the outset of the Irish Civil War in 1922. Lectures will reflect on how societies deal with cultural trauma through reconstruction and commemoration, and on how the international community should respond to contemporary acts of cultural atrocity. 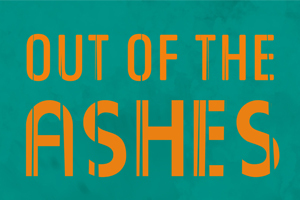 The 'Out of the Ashes' lecture series is generously supported by Sean and Sarah Reynolds.